Valerie Hegarty (American, b. 1967). Fallen Bierstadt, 2007. Foamcore, paint, paper, glue, gel medium, canvas, wire, and wood. 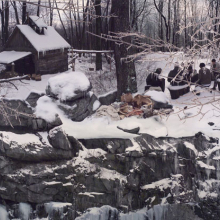 Brooklyn Museum, Gift of Campari, USA, 2008.9a–b. More than forty works from the Brooklyn Museum’s expanding collection of contemporary art goes on long-term view in 5,000 square feet of space newly renovated for this purpose. 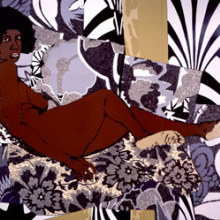 With contemporary works ranging from Andy Warhol’s Fragile Dress (1966) to Mickalene Thomas’s A Little Taste Outside of Love (2007), 21: Selections of Contemporary Art from the Brooklyn Museum focuses primarily on work produced since 2000, particularly from the richly diverse artistic community of Brooklyn. This installation marks the first time in a decade that the Museum has dedicated space to the long-term display of selections of its collection of contemporary art and reflects a renewed interest in acquiring and presenting recent work. 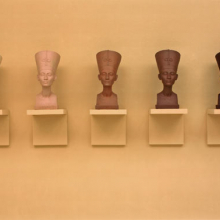 This exhibition is co-organized by Eugenie Tsai, John and Barbara Vogelstein Curator of Contemporary Art, and Patrick Amsellem, Associate Curator of Photography, Brooklyn Museum. The generous support of the John and Barbara Vogelstein Contemporary Acquisitions Challenge has made possible many recent additions to the collection featured in 21: Selections of Contemporary Art from the Brooklyn Museum. 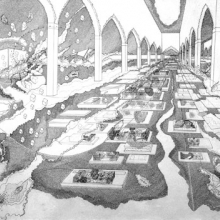 The creation of the new contemporary galleries was made possible, in part, through support provided by the New York City Council through the efforts of Council Member Bill de Blasio. Seher Shah describes her work Interior Courtyard 2. 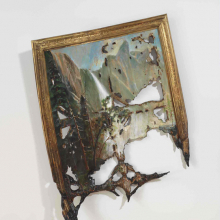 ​Valerie Hegarty discusses her work Fallen Bierstadt.